Tickets will go on sale at a later date and fans are encouraged to download the official Firefly app or subscribe to emails through FireflyFestival.com in order to be notified in advance of the announcement. 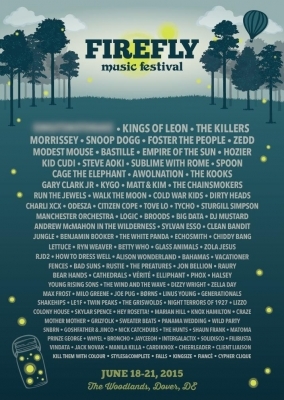 "2015 marks Firefly's fourth year and we're bringing our best lineup to date," says Firefly Music Festival Director Greg Bostrom. "We're looking forward to revealing our third headliner as well as to June while we prepare to give fans the most memorable weekend of their summer." Select Firefly performances will be broadcasted live on AXS TV, with on-air dates June 19-21. Attendees will see the return of favorite attractions such as the Dogfish Head Brewery, The Coffee House, and Hammock Hangout. The â€œBeercadeâ€ (an updated version of The Arcade) will make its debut, along with the announcement of new attractions in the coming months. For the fourth year, fans can support the lifesaving work of St. Jude Children's Research Hospital through a variety of on-site donation opportunities.